Whether for personal growth, new insights, or a different perspective on teaching, the award-winning publications offered by National Council for the Social Studies will help you explore the diversity of subjects and methods in your field. Search or browse the collection of articles from our award winning journals — going back more than two decades! If you are looking for U.S History resources, the curated U.S. History Collection contains classroom activities, teaching ideas, and articles from Social Education, Middle Level Learning, and Social Studies and the Young Learner related to U.S. history that have been specially selected by our editors. Services in left margin, blue type. 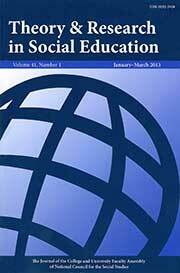 Social Education, our flagship, peer-reviewed journal, contains a balance of theoretical content and practical teaching ideas. The award-winning resources include techniques for using materials in the classroom, information on the latest instructional technology, reviews of educational media, research on significant social studies-related topics, and lesson plans that can be applied to various disciplines. Departments include Lessons on the Law, Surfing the Net, and Teaching with Documents. Social Education is published 6 times per year: the issues of September; October; November/December; January/February; March/April; and May/June. 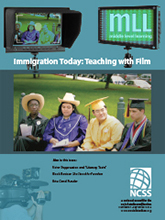 The goal of the peer-reviewed journal Social Studies and the Young Learner is to capture and enthuse elementary teachers across the country by providing relevant and useful information about the teaching of social studies to elementary students.The teaching techniques presented in this peer-reviewed journal are designed to stimulate the reading, writing, and critical thinking skills vital to classroom success. SSYL is published quarterly: the issues of September/October; November/December; January/February; and March/April. 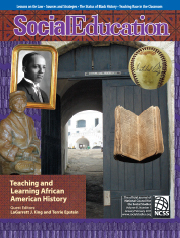 Members who receive SSYL also get two issues of Social Education—the May/June issue (which includes the Notable Trade Books for Young People list) and the September issue. Middle Level Learning brings together lesson ideas and theoretical content focused on social studies in the middle grades. Almost every issue of this peer-reviewed magazine has one or more student handouts. MLL is published online only, 3 times a year: the issues of September; January/February; and May/June. All members can access the current issue of MLL as well as the complete collection of back issues at the members-only online Archive of Publications. 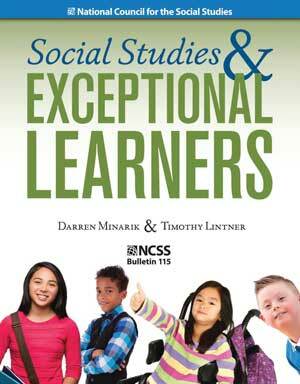 NCSS Bulletins, published twice-yearly in book form, provide an in-depth focus on specific disciplines within social studies. Bulletins and other special books are sent to members as a benefit of Comprehensive membership in NCSS. Clicking on the blue title above will take you to the Online NCSS Store. 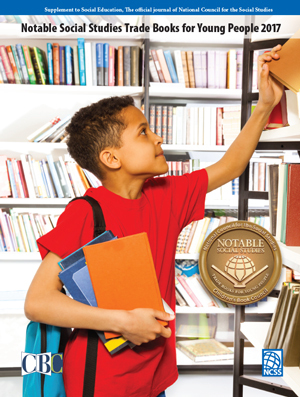 The Notable Trade Books list is published each year as an insert to the May/June issue of Social Education. A pdf of the most recent list is available to NCSS members only in the Archive of Publications. Lists from other past years (2000 onward) are available free. The books that appear in these annotated lists were evaluated and selected by a Book Review Committee appointed by NCSS and assembled in cooperation with the Children’s Book Council (CBC). NCSS and CBC have cooperated on this annual bibliography since 1972. 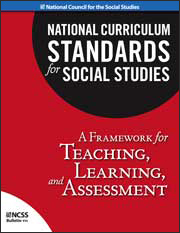 National Curriculum Standards for Social Studies: A Framework for Teaching, Learning, and Assessments. This valuable resource defines and presents each of the ten thematic strands and correlated performance expectations for three distinct levels: early grades, middle grades, and high schools. Included are an executive summary and a special supplement on powerful teaching and learning. Get more information on the "NCSS Curriculum Standards"
The Social Studies Professional (TSSP), the official newsletter of NCSS, is published exclusively online 8 times per year (the issues of September, October, November/December, January/February, March, April, May/June, and July/August). An e-mail announcement will alert NCSS members that the latest issue of TSSP is published, and it can always be found in the online NCSS Publications Archive. Submit your news item to tssp@ncss.org. Announcements of events and resources must be timely: it must be likely that NCSS members will be reading TSSP in advance of the dates listed in your announcement.